Perched high on a hill above what many consider to be the finest view in the west coast of Scotland sits Appin Bay View. A 180 degree view takes in not only sea lochs, islands and mountains, but a bona fide 13c Medieval Castle. ( Fans of Monty Python and the Holy Grail will be familiar with Castle Stalker, but alas the French Knights are no longer in residence!) A private villa for over 30 years, the views and gardens were closed to the public, but with the house fully refurbished we are now delighted to share them with our guests. The views you see on the website are taken directly from our rooms or our breakfast room and balcony. No trick photos!! Appin Bay View is perfectly situated between Glencoe , the most dramatic of The Scottish Glens and Oban, the gateway to the Isles where Calmac ferries sail back and forth and some of the worlds best seafood is on sale. The Village of Port Appin is only 2 miles away and features two international class restaurants, both serving the very best of West Coast seafood. Port Appin is also the place to catch the ferry to the nearby island of Lismore, where visitors can enjoy some quite beautiful walks. Dont be tempted to drink and drive, your host Mike is happy to give you a lift, but give him a little notice! Nearer to home, our local pub The Old Inn is 132 steps from the house ( perhaps a few more on the way back!) and serves some of the finest highland steaks ever cooked. The pub is over 300 years old and reputed to be very very haunted. In winter we are only 20 miles from the Nevis range ski centre and 17 miles from the Glen Coe Ski Lifts. Some of the best winter walking anywhere can be found around Lochaber, and when you come back to Appin Bay View, you can have a fantastic hot shower, jump in to our fluffy bathrobes and snuggle down under your cozy duvet and admire the mountains with a coffee or a glass of wine. 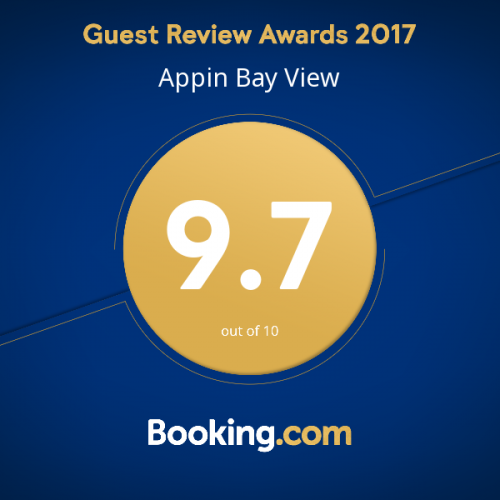 Summer or winter we look forward to looking after you at Appin Bay View. Resaurant Reservations Due to the popularity of our local restaurants, redervations are essential. Usefull numbers are Creaggans 01631730250, The Old Inn 01631730186, and The Pier House on 01631 730 302. Appin is a fantastic halfway point between Lochaber and the outdoor capital of the UK, and Argyll where the land meets the sea and 26 populated islands. World class sailing, hill walking, mountain biking and climbing is on your doorstep, and with two ski resorts within 25 miles, Appin Bay View is the ideal place to explore the west highlands. Whether its paddling through tranquil waters, or cycling on the fantastic and purpose built Connel to Ballachulish cycle track which passes our door, the area around Appin Bay View is overflowing with outdoor possibilities. If charging up and down hills isn?t your thing, then try a little ?slow tourism?. Argyll and Lochaber produce some of the best food produce anywhere in Europe, and we have no less than 15 world class distilleries in Argyll and Lochaber. If you love art, take the Art Map Argyll trail where over 50 artists open their studios to visitors. If you love good food then sit in one of the areas lovely restaurant, smell the peat fires, eat the freshest seafood you will ever see and take a leisurely walk in the amazing scenery close at hand. Try your hand at sketching, or painting, the view from our house has inspired dozens of artists over the years. A huge elegant room beautifully decorated with an antique King size bed andviews over the garden. Well appointed and very peaceful. Massive built in wardrobes provide acres of storage and there is lots of room to sit and relax. Beautiful period furniture and mirrors make this a relaxing and welcoming room. The garden room, like all our rooms and suites The Garden room comes with tea and coffee facilities, comfy arm chairs and super luxurious bathrobes. The Eyrie, or Eagles Nestis a beautiful suite located on the top floor of the house and gives some of the best views across Loch Linnie and the mountains beyond. A beautiful king size bed is complimented by cove windows with cushioned siting areas, the perfect place to sit and read a book orsimply watch the one of Scotland\'s most beautiful vistas. A separate lounge area with bed settee, coffee table and wide screen TV , fridge and coffee making area makes this perfect for our longer staying guestsThe bathroom features a separate shower and bath in which you can lie back and watch the stars.